The Matrox Maevex H264 Encoder/ Decoder utilizes IP to allow multiple signals to travel on the same wire over a network. The brave new world of streaming AV over IP would surely cause Ma Bell to gaze over her wall of point-to-point connections in bewilderment. Our collective fascination with interconnectivity in audio and visual communications began long before the dawn of the technology era, but it’s fast becoming part of the AV integrator’s reality. Early inventors like Alexander Graham Bell foresaw the merging of A with V in nineteenth-century writings and sketches. Now, the point-to-point connections pioneered and popularized by Bell’s audio telephone technology are yielding to streaming communication signals that a large number of users can receive over Ethernet-based IP. Using IP to route AV streams can increase a user’s ability to connect with others for business, worship, learning and other applications, especially where traditional point-to-point connections simply aren’t viable solutions. The most viable ways to explore AV over IP technology today are in deploying HD video signals to numerous displays within a single structure, and for streaming AV to multiple remote sites as opposed to local displays. The Hong Kong Civil Aviation Department uses Matrox Maevex H.264 encoder and decoder devices to stream live, low-bandwidth aircraft traffic footage 2 km (1.2 mi) from the Hong Kong International Airport to its Education Path aviation gallery. “The largest single growth opportunity when you start leveraging ethernet infrastructure to distribute audio and video is that it’s practical to stream over large distances,” said Tom Barnett, director of marketing communications at Crestron. Barnett said that integrators can offer broader usability by sending AV signals over IP, such as linking any AV device for display on the network, but contends that the main excitement is being able to take any of those sources and send them anywhere in the world–or perhaps more commonly, from businesses to clients and satellite offices, or across a campus. Barnett explained that it’s important to understand when AV over IP is the ideal solution and when to use point-to-point wiring. Still, choosing to route AV signals over IP rather than traditional means doesn’t have to be an either/or situation. Users can still use existing technology while jumping on the ethernet IP network selectively. For many AV users with legacy systems, there are fewer challenges to leveraging the IP network than they might expect. AV over IP can expand those systems’ reach and allow them to grow in new ways. However, the fundamentals like choke points, scalability and media quality still apply. 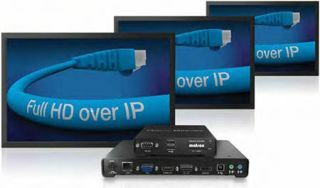 Black Box’s MediaCento IPX PoE multicast transmitter allows users to send video over an IP network to an unlimited number of screens. Since ultra-high definition 4K is here and will likely increase in prominence as the consumer market adapts, SVSi’s Bob Sharp recommends integrators and users think ahead and install more capable networks rather than pulling additional cable later to expand the system. In the meantime, the main issue with 4K technology is upscaling. As AV over IP continues to become a reality in more spaces, the role of an AV integrator could veer toward aesthetician, consultant and proving a business case rather than moving AV around a building. The key, according to Sharp, is to understand where the value of an integrator lays versus IT managers and other technology positions. “The value is no longer having the ability to move the video or audio around a building, it’s the look and feel, the usability, the front-facing side of that installation, how economic it is and how easy it is to use as intended,” said Sharp. Jim Beaugez, APR, is a freelance writer and accredited communications professional with a decade of experience in the MI and pro audio industries. You can reach him at jimbeaugez@gmail.com and on Twitter@JimBeaugez.